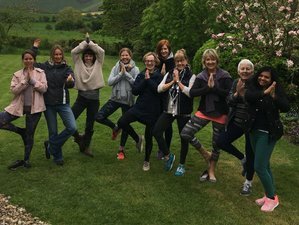 Expert tip: This is one of the most popular yoga retreats offered in the United Kingdom. With our balanced blend of Hatha yoga, Dynamic yoga, and Pilates, your body will be both gently stretched and strengthened and your vitality will be restored. Suitable for all levels, our classes place emphasis on assisting the detox process by gently working but not over working the body. Our expert teachers are also experienced in teaching pre and post-natal clients and those with various conditions including back injuries and back pain. 07:45 - 09:00 Dynamic yoga. 13:45 - 16:00 Holistic treatments, free time, refreshments. All meals, snacks, juices, and drinks. Sally Parkes Yoga is a London-based yoga and Pilates company that specializes in private tuition, classes, and retreats in both the UK and abroad.